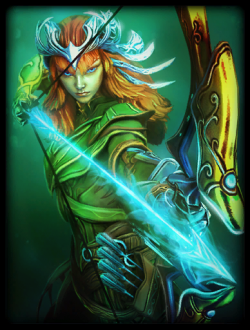 Armed with a magical bow, Artemis is the unrivaled Goddess of the Hunt. Daughter of Zeus and Leta, Artemis and her twin brother Apollo are products of Zeus’ infidelity to his wife Hera. Insulted, Hera cursed Leta while she was pregnant, forbidding her to give birth on land or sea. Fortunately, she found an island that did not touch the ocean floor, so it was neither land nor sea, and thus bore her children. Artemis was born first, then miraculously aided as midwife in the birthing of her brother. Artemis spent her childhood in the hills and forests, training with her bow and hunting beasts. As she grew older and more beautiful, she also grew proud and ruthless when slighted or dishonored, especially against those that claimed to be better hunters than she. Adonis boasted this very thing and Artemis sent a wild boar to skewer him. The twin demigods Otos and Ephialtes, who could not be killed except by each other, threatened to kidnap Artemis and force her to marry one of them, but were tricked when Artemis, appearing as a doe, dashed between them. As they thrust with their spears they impaled each other. Finally, Actaeon, after peeping at Artemis while she bathed, was transformed into a stag and devoured by his own hunting dogs. Such is the wrath of Artemis. Build tested with good results in Arena, Assault and Joust. Artemis is so much powerful hunter. I did penta with this build.